Every Tuesday during football season, editors Jeremy Conlin and Joe Parello bring you the good, bad, and ugly from the football weekend that was. By now you know that the Patriots kicked it old school Saturday night, getting defensive against the Colts in Foxboro and grinding it out with their running game on offense. While the offensive line deserves a great deal of credit, running back LeGarrette Blount was a flat out stud. The physical back ran over and around defenders all day to tie a franchise playoff record with 166 yards, and an absurd four touchdowns. We all knew Blount was a handful to bring down, but he also proved plenty tough to tackle when given some day light. With the Patriots leading by six at the start of the fourth quarter, Blount put an exclamation point on his day, running right, then cutting back left to nothing but open grass. He finished the play by out running everyone in the Colts' secondary for a 73-yard score to, effectively, end the game. Tom Brady is the reason the Patriots got a first round bye and home playoff game, but the running game and Bill Belichick's Midas Touch for mixing up coverages and confusing the young Andrew Luck are the reason they're going to their third consecutive AFC Championship Game. Leading up to the game, there were questions as to how the Patriots would slow down Indianapolis' pass rush, specifically all-world defensive end Robert Mathis. New England left tackle Nate Solder is one of the better players at his position in the league, but Mathis was projected to (and did) spend the majority of the game at the opposite end of the line of scrimmage, potentially feasting on Marcus Cannon, a right tackle roughly the size of a small town, but one who has been taken advantage of by speed rushers this season. So how did the Patriots remedy this troubling matchup? By running the ball straight at Mathis, over and over again. 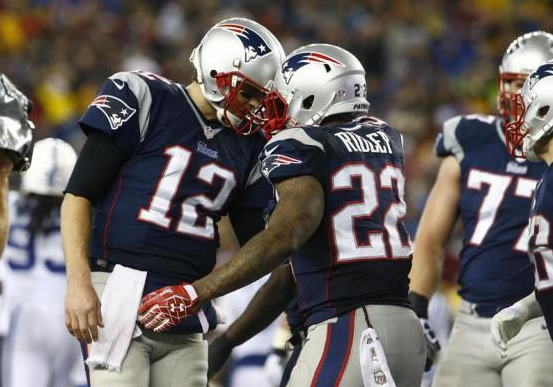 The Patriots had nine rushes between right guard and right tackle, and those runs went for 107 yards and a touchdown. They had four more carries off right tackle, which produced just eight yards, but two of those carries were goal-line attempts by Stevan Ridley, who turned both carries into touchdown plunges. All told, the Patriots ran for 234 yards on 46 carries and six touchdowns, and combined with a few Colts' turnovers, dominated field position 35:00-25:00. And much of it started with Cannon dominating the undersized Mathis. Everybody and their mother has been saying that Peyton Manning needs to be great in these playoffs, because the Broncos don't play any defense. Well, the Broncos D stepped up in a major way against the red-hot San Diego offense, holding the Chargers to just 17 points and 259 yards of offense. Denver generated constant pressure on Phillip Rivers, sacking him four times, and holding the Chargers to just 4-12 on third down. San Diego finished the regular season with a league best 50 percent efficiency on third down, if you're curious. One of the major reasons Denver was so successful on defense was the fact that they scored early and put the Chargers in a pass-first mind set, but once they got them there, Shaun Phillips did the rest. Phillips has been one of the lesser appreciated players in the league this season, mostly because people are spending so much time talking about who the Broncos' pass rush DOESN'T have. Yes, they lost Elvis Dumervil to a contract signed six minutes too late, and yes, they've been without Von Miller for the majority of the year as the explosive pass rusher missed time due to both suspension and injury. In their place, the 10-year veteran has had, perhaps, his best season. Phillips finished the year with 10 sacks, forcing fumbles on two of them, and added another two sacks last week as the Broncos closed the door on Rivers and the Chargers. He wasn't an All Pro, but Phillips has played well enough to make the Broncos just good enough on defense to get to the Super Bowl. That is, unless the Patriots just run it down their throat next week. After trading a first-round pick for him, Richardson had a whopping three carries for one yard against one of the worst run defenses in the league. This was following up a game in which his only carry produced an un-forced fumble against Kansas City (officially, Tamba Hali was credited with the forced fumble, but it actually occurred a split-second after Hali's swipe, when Richardson tried to exchange the ball between his hands and promptly dropped it). For a player who was drafted No. 3 overall and then was traded for another first-round pick, he hasn't really shown much to live up to either of those valuations. The best running back in the game this past Sunday was the above-mentioned LeGarrette Blount, a player who was undrafted in 2010 and moved to the Patriots this year in exchange for a 5th-round pick. The moral of the story: running backs are a crap chute. The first meeting between the Panthers and 49ers was, in large part, decided based on a dominant Panther pass rush - they sacked Colin Kaepernick six times in just 28 drop backs, a higher sack rate (21.4%) than any other team in any other game save for one all season long. In Sunday's tilt, the tables were turned. The Panthers sacked Kaepernick just once, and it came on a delayed blitz by Luke Kuechly that San Francisco's offensive line completely missed. Their straight four-man rushes (which dominated the game in Week 10) where nowhere to be found. Meanwhile, the 49ers picked up five sacks on Cam Newton, and were able to do so without much heavy blitzing. Ahmad Brooks continued his hot streak with 2.5 sacks, adding to his 2.0 sacks in the Wild Card round against Green Bay. Seattle's 12th Man has earned the reputation as the NFL's loudest home field advantage in recent years, but for the second time in three years, they have actually shaken the Earth. According to The Weather Channel, seismologists believe Seahawks fans caused a small earthquake underneath CenturyLink Field during one of Marshawn Lynch's touchdown runs Saturday. Fans at the Link gained fame in the 2011 playoffs, when they caused another small quake on Lynch's famous "Beast Mode" run, also against the Saints. Seattle fans nicknamed the occurrence the "Beast Quake," but it appears this quake was even larger. Opponents already have to deal with one of the league's best defenses, most physical offenses and loudest crowds when they travel to Seattle, but now they even have to deal with the threat of seismic activity. Well, I guess if any team is prepared to play in an earthquake, it's one from San Francisco. Okay, I'll level with everyone here and say that obviously, the Saints probably weren't going to tie the game up with 13 seconds left with the ball at mid-field with no timeouts. But they had a chance. Drew Brees escaped the rush and hit a wide-open Marques Colston AT THE SIDELINE with seven seconds remaining. All Colston had to do was step out of bounds and the Saints would have at least one more snap, possibly even two depending on (a) how quickly the clock stopped after Colston stepped out of bounds, and (b) how quickly the Saints are able to execute a 5-yard out route. In any event, the Saints would have another snap from roughly the 36-yard line. All Colston had to do was step about four inches to his right. Did he? Colston opted to cut towards the middle of the field and unleash a pass that traveled about five yards up-field before falling into the hands of Khiry Robinson. In case you didn't know, that's illegal. It seems like it was a designed play, as Colston moved immediately to throw the ball, and Robinson was wide open on the far sideline. Had the pass been legal (i.e. backwards and not technically a pass), Robinson could have advanced to roughly the 25-yard line with time for one more snap. The question becomes - is the CHANCE at advancing 10 yards worth those five or six extra seconds, especially considering the logistics of the play seem way too complicated to pull off with any regularity? If you're playing for your season, doesn't it make sense to just, you know, step out of bounds? The idea makes sense if Colston catches the ball in the middle of the field and can't get tackled (as the Saints had no timeouts and wouldn't have enough time to run up and spike the ball), but he didn't. He was standing next to a free timeout. In the grand scheme of things, it doesn't really matter - New Orleans would have needed to score from the 36-yard line in seven seconds and THEN convert a two-point conversion just to send the game into overtime (where they very well could have lost). But the slim chance they did have was squandered.